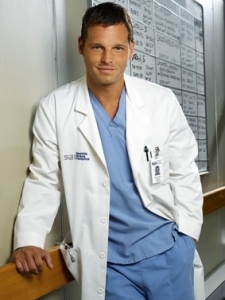 Alex appears from the first episode of Grey's Anatomy, having secured a position in the surgical residency program at Seattle Grace Hospital after graduating from the University of Iowa. He initially makes a poor impression on his fellow interns, and taunts Izzie Stevens (Katherine Heigl) when he discovers she used to be a lingerie model. After initial disagreements, Alex reveals to Izzie that his father was a heroin addict who used to beat his mother. He became a wrestler so he could defend his mother, and attended university on a wrestling scholarship. He and Izzie begin a friendship. At the end of the first season, George O'Malley contracts syphilis from Alex through nurse Olivia Harper, causing animosity between the two. 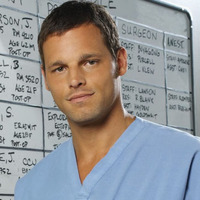 In the show's second season, Alex asks Izzie out in a date, but he is thrown by the news he has failed his medical board exams. Izzie is offended since he pays no attention to her during their date and so informs him that she no longer wants to go out with him. He later freezes during an emergency operation, needing George to take over from him. Alex's relationship with Izzie is damaged when he experiences erectile dysfunction with her. He goes on to sleep with Olivia again, and when they are caught by Izzie, she breaks up with him. After retaking his exams, Alex manages a pass, and reunites with Izzie after a bomb scare in the hospital. They break up again, however, when Izzie falls for cardiothoracic patient Denny Duquette. 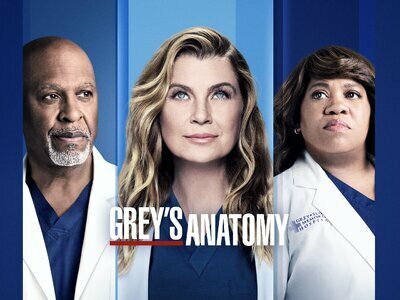 Alex spends a period of time working under neonatal surgeon Addison Montgomery (Kate Walsh), and though he is later released to work for plastic surgeon Mark Sloan (Eric Dane), he finds his interest returning to Addison's firm. Addison is attracted to Alex, and the two share a kiss and later sleep together. However, Alex refutes her further advances. In the aftermath of a ferry accident, Alex rescues a pregnant woman from beneath a fallen pylon. She awakes with amnesia, and grows close to Alex who helps her forge an identity for herself, picking out the name Ava. After she gives birth to her daughter, Ava's memory eventually returns, although she tries to hide it from Alex as she had recently left a bad marriage. He convinces her to tell him her true identity, and she reveals herself to be Rebecca Pope. When Rebecca's husband arrives at the hospital, she asks Alex to give her a reason to stay in Seattle. Alex turns her down, feeling that he is not good enough for her. Addison urges Alex to reconsider, but when he returns to the hospital, Rebecca has been discharged. Rebecca returns in the show's fourth season, and she and Alex sleep together before she goes back to her husband. Alex has a brief relationship with intern Lexie Grey (Chyler Leigh), but chooses to be with Rebecca when she returns and tells him she is pregnant. Izzie discovers that Rebecca is not in fact pregnant, and Alex cares for Rebecca when she becomes increasingly hysterical. After Rebecca slits her wrists, Izzie convinces Alex to admit her for psychiatric help. Alex discovers that Rebecca's husband has left her and taken their child, and that she is mentally ill. Alex breaks down in Izzie's arms, and the two kiss. In the aftermath of Rebecca's breakdown, Alex lashes out at Izzie, though they later go on to begin their relationship anew. Izzie begins hallucinating about Denny, and uncovers the fact she has metastatic melanoma (Stage IV) with an estimated chance of 5% survival. Alex is shocked by the news, but finds the strength to stay by her side. Izzie plans a wedding for their friends Meredith and Derek, but when Derek finds Izzie has another inoperable tumor in her brain, they give the wedding to Izzie and Alex, who marry in front of all their friends. After their impromptu wedding, Izzie debates whether or not she should undergo a risky surgery to remove her tumour. Alex supports her, but eventually insists that she should have the surgery. Izzie agrees but signs a DNR form. Alex begs her to reconsider, but Izzie refuses and tells him that "if it comes down to it" he must let her go. After the surgery, Izzie loses her short-term memory and Alex works to help her regain it, which she does after an argument between the two. After they both realise that she has regained her memory, Alex apologises for his earlier outburst, but Izzie's heart rate flatlines. The scene ends as Izzie's friends and coworkers ignore the DNR order in an attempt to resuscitate her, and Alex looks on tearfully. In the next season, Izzie regains a heartbeat. Both Izzie and Alex move out of Meredith's house and into Derek's trailer in the woods. But in a turn of events due to the failing economy, Seattle Grace has to make job cuts as they merge with "rival" hospital Mercy West. Fearing for her job, Izzie returns to work even though she is still undergoing treatment for her cancer. Izzie commits a grave mistake on a patient and gets fired. After being let go, Izzie disappears, leaving Alex a "Dear John" letter and no clue as to her whereabouts. Alex is currently trying to get back in touch with Izzie, but she is unreachable. When Izzie came to the hospital, she and Alex spoke in the gallery. She informed Alex that she could not forgive him for talking to the Chief. Alex said he could not forgive her either for leaving without talking to him to first and left her alone in the gallery. When Meredith fears Alex will start sleeping around again to forget about his pain, she calls Izzie and tells her Alex might be moving on. At the same time, Alex has a one-night stand with Lexie. When Izzie arrives back home next morning, Alex almost immediately tells her he slept with someone else, but Izzie tells him they'll get through this. When she later sees him with the results of her headscan earlier that day, they hug and Alex tells her he loves her so much, and that she made him a better guy. But being that better guy now, he finally understands he's too good for this, he doesn't deserve to be treated like this, so he asks her to move on with her life, like he will; without each other. Alex seems to have recently found that is calling is actually paeds and not plastics as he had decided in the earlier seasons. Seeing Alex's ability to handle child patients Robbins shows an interest in mentoring him for that specialisation. Initially considering it to be too be a girls' job Alex did not want to consider the same however he too is shows to be developing a knack for it now.